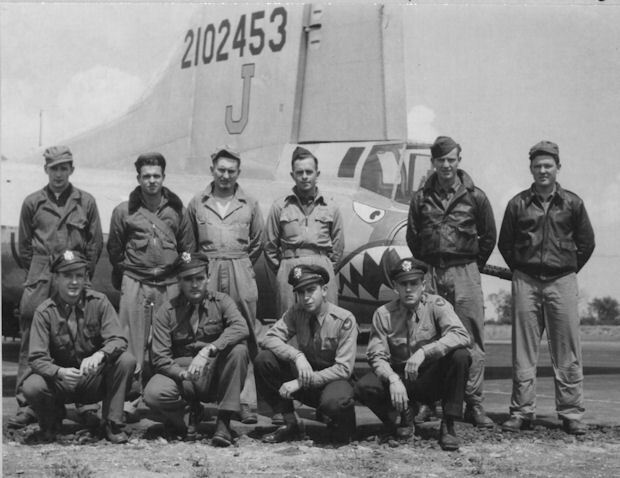 Original 22 June 44 crewman Sgt James B. Nelson (WG) deleted from when crew size was reduced from 10 to 9 men, and is not in photos. 2Lt Robert G. Taylor (CP) - Stood down on missions 196 & 200. Experienced combat orientation Pilot, 2Lt Telesphor Lojewski, used on these missions and 2Lt Boyce flew as CoPilot. 2Lt Melvin A. Brown (N) - Stood down on mission 196. Substitute Navigator was 2Lt Maxwell I. Wynar. Sgt Robert L. Baker (BTG) - Stood down on mission 204. Substitute BTG was Sgt Paul L. LaFleur. 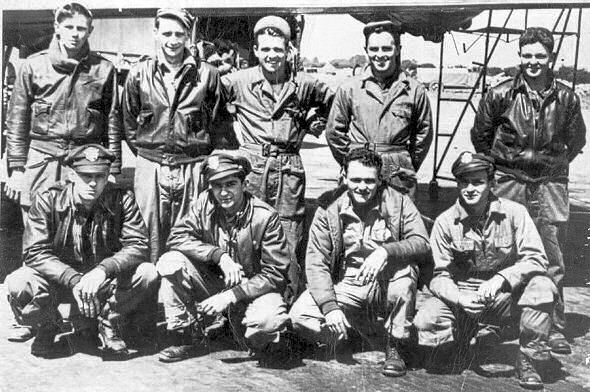 2Lt Lawrence M. "Larry" Wolf (B) - Stood down on mission 207 - Substitute Bombardier was 1Lt Stanley E. Moody who became a POW. 2Lt Wolf flew on five additional missions with five different Pilots (211, 215, 218, 225, 229). Was KIA on mission 229 to Wiesbaden, Germany in 43-37838 Fearless Fosdick (358BS) VK-A, Capt Arnold S. Litman, Lead Crew Pilot. A 20 mm shell exploded in 2Lt Wolf's back. He immediately lost consciousness and died within 10 minutes with the crew Navigator tending him until he died. The B-17 crashed landed near Beine-Nauroy, France and Germans removed his body from the crashed B-17. He is buried in the Restland Memorial Park, Dallas, TX. The other eight crewmen evaded capture. S/Sgt William P. Truesdell was captured and made a POW twice and he escaped both times and returned to London on 5 Sept 1944. A monument, dedicated on 21 April 1990, was erected at Beine-Nauroy, France (near Reims) honoring 2Lt Wolf and the French Resistance who aided eight members of the Capt Litman crew to evade capture. KIA-POW Shot down by ME-109 German fighters on mission #207, 19 July 44 to Hollriegelsreth, Germany in B-17G 358th BS Little Princess #42-31583 (VK-C). Little Princess was straggling from flak damage acquired on the bomb run. A ME-109 came in and gave the B -17 a long burst, peeled away, turned back and gave another short burst and then zoomed up for a third burst. At this time a P-51 arrived and shot down the ME-109. The P-51 then came up and flew alongside Little Princess, wiggled his wings and flew away to hunt for more German fighters. Five crewmen made successful parachute jumps landing near Munich, Germany. Lt R.G. Taylor suffered wounds in his leg and foot and was treated by German doctors. The B-17 crashed at Tutzing, Germany. 2Lt Wolf was not on that mission. Bombardier was 1Lt S.E. Moody (POW).